Show your love this Valentine’s Day with tasty mini cream puffs served with a creamy cinnamon sauce. 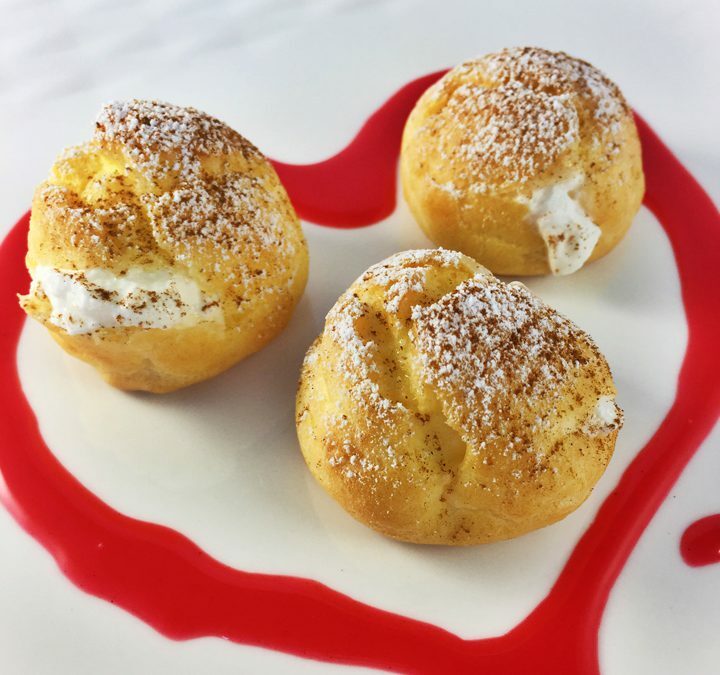 Using pâte à choux dough to make these little treats, they are baked and filled with cinnamon whipped cream for a delightful Valentine treat. Our tasty dipping cinnamon sauce uses “Red Hots” candy tamed with cream to a beautiful rich smooth cinnamon flavor. If you’re not a fan of “Red Hots” don’t let that deter you from trying this sauce – it has converted many who are not a fan of the candy. The cream softens the flavor to make a sweet, smooth, creamy cinnamon sauce. In a medium saucepan over medium-high heat, combine water, salt, butter, and sugar. Bring to a boil and quickly stir in all at once the flour with a wooden spoon. Continue stirring for about 3 minutes or until the cohesive mixture starts to pull away from the pan and leaves a film of flour on the sides of the pan. Remove from heat and transfer contents to the bowl of a stand mixer fitted with a paddle attachment. Beat for one minute or until slightly cooled. Add four of the eggs, one at a time, beating vigorously to incorporate the egg after each addition entirely. Check the consistency of the batter by dragging a wooden spoon through it. When the groove slowly closes on itself, you have added enough eggs. If not, add egg whites, one at a time, until the dough passes the groove test. Transfer the dough to a large pastry bag fitted with a 5/8-inch plain tip. Pipe 1-1/2-inch rounds onto each parchment lined sheet tray. Gently smooth the pointed peaks with a moistened finger, rounding the tops to ensure even rising. Brush tops with the egg wash. Bake until puffs rise and are golden brown, about 20 minutes. Remove baked puffs from the oven and using a very sharp knife, cut a slit into the side of each one allowing steam to escape and help prevent soggy puffs. Return them to the oven for 5 minutes longer, then remove from the oven and transfer to a wire rack to cool. Store the baked Puffs at room temperature for up to 1 day. In a small saucepan, combine the sugar, Red Hots candy, cinnamon, cornstarch, and water. Bring to a boil over medium heat, frequently stirring to melt the candy. When dissolved, boil for 5 minutes, stirring the entire time. Remove from the heat and strain through a fine-mesh sieve lined with cheesecloth into a bowl. (This removes any impurities or wax in the candy.) Add back into a clean saucepan over medium heat and return to a boil; whisk in the cream and food coloring. Reduce the heat to medium-low, so the sauce is at just a simmer and cook, occasionally stirring, for 5 minutes. Remove from heat, cool to room temperature, and store in the refrigerator. The sauce can be made the day before use. Pour heavy cream into chilled bowl. Beat on high speed using a stand mixer or hand mixer fitted with a whisk attachment. Slowly add the sugar and cinnamon. Continue beating until stiff peaks form. Transfer the whipped cream into pastry bag fitted with a small plain round tip. Insert the tip into the slit in each puff, and pipe to fill with the cinnamon pastry cream. Mix the powdered sugar and cinnamon. Sprinkle evenly over the cream puffs. Serve immediately with the Cinnamon Sauce on the plate or serve on the side. Makes 25-30 mini-puffs.